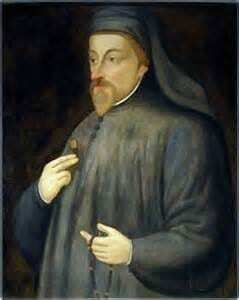 Geoffrey Chaucer stands as the great giant of English poetry. His verse is still read and enjoyed today and often adapted for theatre performances. It is full of characters, still recognisable as types we encounter in daily life in spite of having been inspired by people Chaucer observed more than seven hundred years ago. There is a freshness in Chaucer’s poetry. His characters act their lives out in every conceivable human situation from the deeply serious to the crude, belly laughing comical. His stories are both funny and thought-provoking: people caught in sexual mix-ups; two young knights fighting to the death for the love of a beautiful young woman; a badly behaved young knight travelling the country on a desperate quest to find the answer to a question that will save his life and learning a great lesson; the tragic love story of Tristan the son of the Trojan king, and the beautiful young Isolde; young wives giving their old husbands the slip to sleep with handsome young suitors. The list of human tales goes on indefinitely, and all of them still appealing to the modern reader. If a writer can connect with a readership seven centuries after his death he is most certainly a great writer. Geoffrey Chaucer led an eventful, exciting life, by any standards. He is known to us as a poet and, indeed, he has the distinction of being the first poet to be buried in poet’s corner in Westminster Abbey, but that was, to him, not much more than an interest. He was an immensely, multi, talented man with a long and very successful full-time career as a diplomat. He was also a philosopher, astronomer and alchemist. In his own time Chaucer would have been far better known as a diplomat than a poet. He was greatly valued by Edward III. During the Hundred Years War, Chaucer was on a mission to Rhiems in 1360, when he was captured. The King paid a £16 ransom, which was worth a few hundred thousand dollars in today’s currency, to get him back. Chaucer was deeply immersed in public life and he established a family tradition of that, his son, Thomas rising to distinguished heights, including the position of Speaker of the House of Commons. While pursuing his career, Chaucer was writing his poems and reading them aloud at court, no doubt amid great laughter. His most famous work is The Canterbury Tales, a series of fictional tales related by pilgrims on their way to Canterbury, and part of its fame and importance is that it was revolutionary as an English literary work. It is not only written in vernacular English but its characters talk in a naturalistic way, according to their class and background – something unknown in English literature until this moment. The narrators of the stories talk in a way fitted to their characters and states of life rather than in stylised conventional language. Readings of such verse would have been immensely engaging and the language offered opportunities for humour. Chaucer had many jobs during his life – soldier, messenger, valet, administrator, clerk etc. – and had observed colleagues in all of these areas, allowing him to portray them convincingly in his tales. Chaucer’s influence on English literature is one thing; he also had an enormous influence on the development of the English language. This is clear when one looks at other English texts of his time, which are almost unrecognisable as English while his are fairly easily comprehensible to the modern reader. In using language the way he did he pointed the way forward.